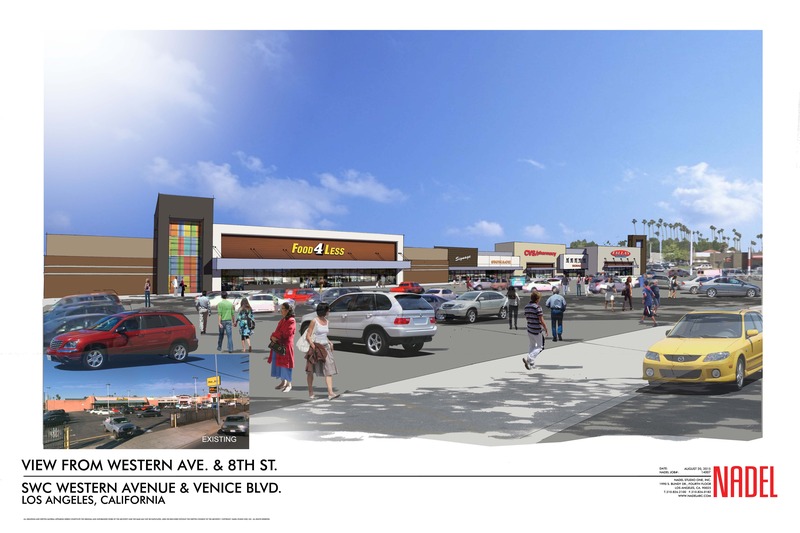 Western & Venice is an 85,000+ square foot shopping center located in Los Angeles, California at the northwest corner of Western Avenue and Venice Boulevard. The project site is bounded by 18th Street to the south, Western Avenue to the east, Venice Boulevard to the north, and an alley to the west. Urban One was hired by Western Avenue Capital to redevelop of center, which is anchored by Food4Less, CVS and Factory-2-U, and has approximately 12 operating tenants. The broad scope of work consists of the rehabilitation of the shopping center and entails an updated exterior façade and architectural components, as well as site improvements for both aesthetic and ADA purposes. All of the existing retailers will remain open during the center’s upgrades, which are scheduled to begin in May 2016. Food4Less will be renovating the interior of their store as well, commencing in the summer of 2016. Urban One’s role on this project has been to assist in all facets of development management and construction management. Geotechnical Engineer Krazan & Associates, Inc.
Western & Venice SC, LLC is a single-purpose entity that owns the Western & Venice Shopping Center. The owners are with Western Avenue Capital, which is a real estate investment, development and management company headquartered in Los Angeles, California. Over the past 40 years, its predecessor companies have established a diversified portfolio of retail, healthcare, multifamily and industrial properties across the United States, with the majority of assets in the Los Angeles area. Western Avenue Capital’s total portfolio capitalization (managed and passive) currently exceeds $1 billion across 3 million square feet. Western Avenue Capital’s co-founders and partners are David Kasirer, Josh Kaplan & Jonathan Kasirer. Check out progress photos of the Western & Venice shopping center improvements on Urban One’s Flickr page.